The AdSense program has been under a lot of scrutiny over the past few years. Even I’ve been openly critical about some of the aspects of the program such as lack of transparency, minimal support for smaller publishers and inconsistent advice. Nevertheless, it’s been a nice stream of income for me since 2003 and the RPM (average revenue per page) has outperformed any alternative I’ve tried — including selling ads directly. So I decided to dive into this subject for my 3rd podcast (here’s the transcript) since I get so many questions about it. StudioPress themes (affiliate link) Many of their themes have header widgets for larger AdSense ads. This is one thing that impressed me and your story how you did all of those ways you monetize your blog. Thank you so much for all of your information and effort here. Just started with AdSense on my new blog about why it’s silly to put your wet phone in rice @ http://lookandcarry.com I’m only at a few bucks in revenue, but I just started a few days ago. Your tips have been super helpful. A well planned day always helps, and I think you can cover a great deal in the early morning hours. I guess that too depends from one person to another. For some the night hours work better, so one can’t really say. One does need to take care of having a little bit of exercise, adequate rest, sleep, and follow a good diet as well. Simple things that we writers tend to ignore because of the sedentary lifestyle we all lead, and unknowingly it leads to health issues that we sit and regret later. Thank you so much for all of your information and effort here. Just started with AdSense on my new blog about why it’s silly to put your wet phone in rice @ http://www.riceisfordinner.com I’m only at a few bucks in revenue, but I just started a few days ago. Your tips have been super helpful. Ok the question is can i still make money with adsense if there are not pay per click advertisers? Can i still show remarketing ads from other sites and still make decent adsense earnings? I stumbled upon your great YouTube videos and then headed on over to your website. You know what your doing! I am a new blogger who needs your guidance, and since you speak in lamen terms 🙂 I wanted to ask you about begining to blog and adsense. I am totally confused with it. I wanted to use adsence on my YouTube videos but it wont allow me to register on the site. I mean I can monitize my videos but I cant log into an adsense account. I feel like giving up but Im not a quitter. Can you please help? Thank you so much. Hey Lisa! Great Podcast, I LOVED the part where you sang Justin Bieber haha. Thank you very much for this, It’s great that you are keeping up with the times and switching to different methods such as this! LOL! Good ole’ Justin. Glad you enjoyed the podcast Sebastian. Thanks for listening. Hi! I really like this article but I think that the visitors have learned to ignore adsense. It is much more profitable to have affiliates as far as I have noticed. The first thing I thought…”Ooh, Lisa’s got a new intro…very nice!” 🙂 I really appreciate the time you take to put together such informative podcasts and videos. Thanks for the helpful tips! LOL! Thanks so much Christina! Lisa first of all thanks for the detailed and value adding podcast. Here I would like to share my experience about Google AdSense. In the past I tried using adsense ads on BloggersPassion for two to three months. But the earnings were really low compared to the traffic my blog had. Soi have to start looking out for additional ways to earn money. With this blog, I find affiliate marketing more rewarding than AdSense. But with other information blog that I am running, AdSense ads are performing as per my expectation. 1) One of the ways I personally protected my Adsense account after I was getting fraudulent clicks (there were a ton of people getting banned in March 2013 because of this) was through setting up a Cloudflare account and running my nameservers through there. This stopped the fraudulent clicks. 2) When this Adsense attack was going on, I reported it. I know that you said it can go both ways in terms of getting banned or not but I did the report plus Cloudflare and it saved my account. 2) I have to get to work on the placement links because right now I am at 0%! Therefore I better start adding to the descriptions as you suggested. 3) Currently, I make more than twice my money from media.net vs Adsense. I added this in March 2013 during the attack because I was worried about a ban from Adsense. Right now though I try to far more Media.net adds as opposed to Adsense, so that is the reason for the difference in the cash. But for those who get banned from Adsense Media.net is a terrific alternative. No problem. I personally think that it was the primary reason my account was saved. If I remember from my research in the forums at that time, there was some type of attack from Germany resulting in thousands of websites getting fraudulent clicks…and a ton of people getting banned. After it started I reported it to Google, put my site into maintenance mode and then asked you for help. Cloudflare was one of your recommendations. I pointed my nameservers through Cloudflare and have not had a problem since. It’s hard to understand AdSense, but this report is helping me. Again Nice Article Lisa 🙂 I just started using AdSense Ad. Your tips are nice on track. It really helped me a lot and learned new things about Google AdSense. Very well written and detailed explanation of cpc ad placement. I need to move some AdSense up above the fold as you suggest because I think they are getting missed way too often when they are buried inside the blog post near the bottom. I think I’ll to a test for about a week and let you know what kind of difference that makes. Thanks for the advice. Ah! Finally there’s this article that helped me understand everything I never did. Many myths busted, many information gained. Thanks. Are you going to take callers to your show in the future? 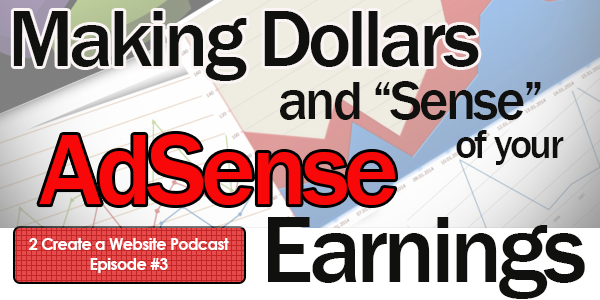 The podcast is a great resource foe affiliate and adsense money makers. Adsense is good way to go on a website with huge real traffic. Whatever the case, as an adsense earner,we need to make a keen eye on our CTR to measure the profitability. I stopped in to say good job with this podcast and to also add in that doing the podcast and adding the PDF to read along is awesome!!!!!!! I learned a ton from this! Lisa, you are the best in the business. No nonsense, to the point, honest, direct, incredibly informative. Everything you do is packed with so much information it’s like going to school. I’m so glad I found you online last year and so glad you are now doing podcasts! Thanks for linking to my Adsense Alternatives Article. Great job on your podcast! Hi Lisa, thanks for covering this topic. I began using adsense earlier this year and wondered about many of the things you covered here. You’ve shared terrific info – thank you so much! Adsense is certainly a best bet to earn money, though getting adsense approval is time consuming and many times frustrate bloggers. I have heard number of times that if you blog post is ranking for high CPC keywords then you’re more likely to earn higher pay for any click on your adsense ad click. Some new things to learn and some good reminders. Thanks. But as per my experience, It is always better to have affiliate products if we have a niche website. For general topic blogs, Adsense work much better in case we get good CTR and CPC. Thanks for the podcast. You made a great point about Adsense ads, Affiliate products and click through rates. I thought about removing Adsense ads from my best converting affiliate product pages to see if I could get a few more sales. I just peaked at the Adsense click through rates on these pages and they are pretty low. Thus, I plan to continue displaying the adds along with the affiliate links. Thanks for the tip! No problem, Quentin. Good luck! Finally, an explanation I understand about AdSense!!! Google’s explanation was clear as mud to me for years. Now I have a better grip on this topic. Thanks Lisa!!! Also, GREAT opening to your pod cast. I like it and comes across as very professionally done. Hey John, thank you so much! Glad I was able to shed some light.